I so frequently find an outlet in the Twittosphere these days, that I haven’t written a post in criminal ages. Forgive me, faithful readers – all four point five of you. There should be plenty to say. Life is eventful, interesting – full of spectacle, loss, dreams and anxiety. And that’s just two weeks! Lots that’s too private to write about (though my notion of privacy is uncommon, I am sure you’ll understand). 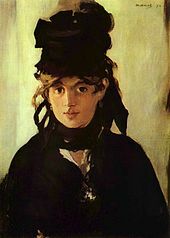 Here’s a picture of Berthe Morisot by Manet. This painting says a thing or two about privacy and secrets. You can see the real thing at the Royal Academy right now. I should warn you that while the paintings are amazing, I did not like the way the show was curated. The illustrious curator kept banging on about “bourgeois leisure pursuits”, wheeled out every cultural theory cliche about Paris in the Nineteenth Century, and made the odd intrusive judgement about the canvases, which irritated me. Still the Manet show was far less troubling than the captions I had to suffer at the British Library’s exhibition about Mughal India. The venerable place had some wonderful pieces on display, but I was disappointed by some real Orientalist clangers in the curating.